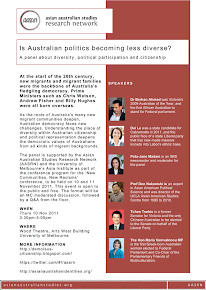 Diversity | Political Participation | Citizenship: Last chance to register for the 2011 Dragon Tails conference! Last chance to register for the 2011 Dragon Tails conference! Come and be part of discussions about current and future directions in Chinese Australian history and heritage at Dragon Tails 2011: sources, language, approaches, the second Australasian conference on overseas Chinese history & heritage, to be held at the Museum of Chinese Australian History, Melbourne, Australia on 11–13 November 2011. Sponsored by the AASRN and University of Melbourne's Asia Institute, this event is open to the public and free. I work for the National Tertiary Education Union (NTEU) and am completing a doctorate on Chinese Australian legislative recruitment and political engagement. I'm fascinated with methodologies investigating the various dimensions of politics and power in our lives.